Hanley PLLC and has taken a position as Of Counsel with that firm. been involved in hundreds of security disputes, both as an arbitrator and as an attorney on behalf of customers. Jim has represented customers in securities disputes in State and Federal courts, as well as in NASD and FINRA arbitrations. Jim continues to focus his practice on securities litigation and enjoys the challenges these cases present. 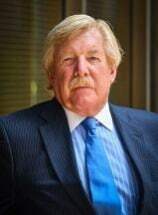 Jim has recovered on behalf of injured investors millions of dollars in cases against the following firms: Merrill Lynch; J.C. Bradford & Co.; J.J.B. Hilliard, W.L. Lyons, LLC; PNC Securities; Auerbach, Pollack and Richardson; Fifth Third Bank Securities, Inc.; LCP Capital Corporation; UBS Financial Services, Inc.; PaineWebber, Inc.; Wells Fargo Advisors, LLC; Raymond James; Morgan Keegan & Company, Inc.; Ameriprise Financial Services, Inc.; Midland National Insurance Company; Sterne, Agee & Leach; Bryon N. Milby, CPA; Jonathan N. Leber; Tembion Capital Management, LLC; Allianz Life Insurance Company of North America; Smith Barney; Sterling Financial Group, Ltd.; Advest, Inc.; Citi Group Global Markets, Inc.; Sand Brothers and Company, Limited; U.S. Bank Corp Investments, Inc.; Prudential Securities, Inc.
entertaining their grandchildren, boating, playing billiards, and entertaining friends. Securities Arbitration, Louisville Bar Assn. Child Support Enforcement, Louisville Bar Assn.